Santan Dharma College (Lahore), Ambala Cantt celebrated its Annual Convocation and Prize Distribution Function on 23 April 2018. Chief Guest for the Annual Convocation, Anil Vij, Cabinet Minister, Haryana also inaugurated the 110 Kw Solar Power Plant installed in the college which shall produce 1.7 lakh units of electricity per year making the college self-sufficient in power. 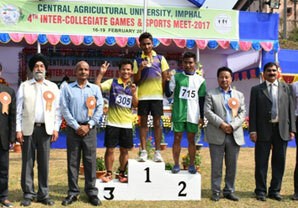 The Chief Guest announced a grant of Rs 20 lakh to his alma mater and praised the college for its unprecedented success in every field, especially applauding the fact that the college had attained ‘A+ Grade’ with a CGPA of 3.51 out of 4 in the recently conducted accreditation by NAAC, Bengaluru. Principal Dr Rajinder Singh read out the Annual Report of the college and gave away 450 degrees to the Post- graduates and Graduates from Science, Commerce and Arts streams. 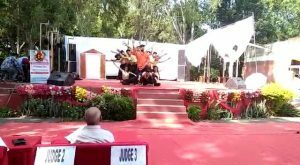 Same day the Annual Prize Distribution of the college was held and the ChiefGuest on the occasion was Lt. Gen. Alok Singh Kler, VSM. 498 prizes were disbursed for academics, sports,cultural and other activities. Three faculty members of the college- Dr Rajni Gupta, Dr Rubi Wadhwa and Dr Bhim Singh were felicitated on the occasion for having successfully completed their Ph. D. National Festivals are celebrated in the college with great patriotic fervor and zeal. This year too, these festivals of national glory were celebrated with great enthusiasm. To celebrate the upgration of Ambala Cantt as a division, a Divisional Level Function was held where Sh Subhash Chand Sihag, SDM, Ambala Cantt who unfurled the tricolor on the occasion of the Independence Day. On Republic Day, Sh Subhash Chand Sihag , SDM, Ambala Cantt graced the occasion with his presence, hoisted the National Flag and received the Guard of Honour along with the Principal, Dr. Rajinder Singh at a Division Level function.